I start my morning filling with coffee and filled with gratitude. Yesterday, we had a case recommended by one of our newer veterinarians. She recommended a COHAT (Comprehensive Oral Health Assessment and Treatment) for a healthy, 2 year old, spayed, domestic feline. The notes in the medical record indicated that there was mild tartar and some localized gingivitis. As I was looking over the cases for the day and triaging their order in the dentistry schedule, this case was going to be the “quickie”. Anesthetize, clean, chart, intraoral radiographs and recover. For all intents and purposes, this would have been a “grade 1” dentistry. Well, we charted a 1 mm periodontal pocket lingual to the left lower third premolar and a 2 mm periodontal pocket lingual to the left lower molar. Then with elegant use of the explorer, we noted pathology below the gingival line. We perform full mouth X-rays on every dentistry because Drs Holmstrom, Eisner and Frost published in Veterinary Dental Techniques for the Small Animal Practitioner that 27.8% of clinically important findings are only found with intraoral radiographs in the dog and 41.7% in our feline patients. 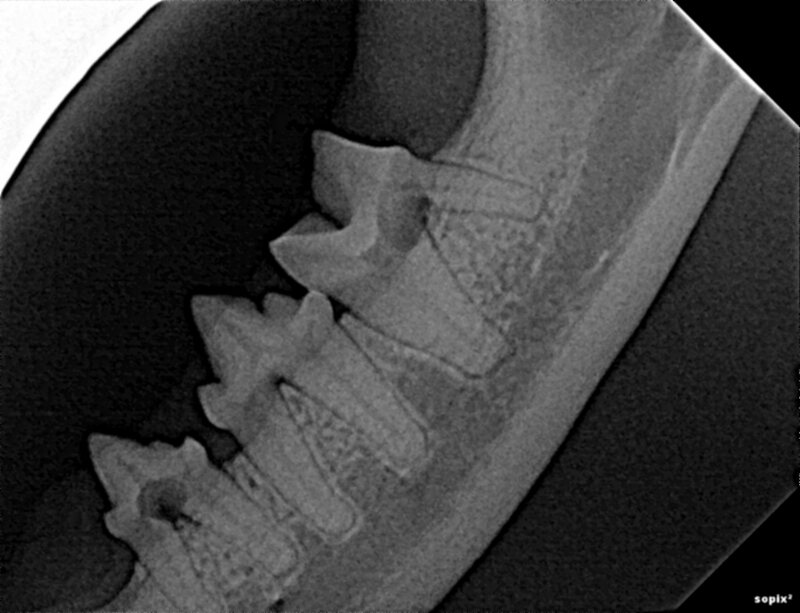 As you can see in this X-ray of the same 2 year old cat with little to no gross, clinical pathology, there were resorptive lesions on both the left lower third premolar and the left lower molar. 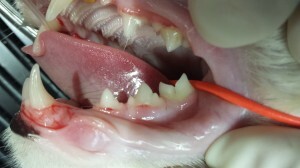 Left undetected, this young, active cat would have gone home with two painful lesions in her mouth, the owner would have paid for dentistry thinking everything was OK and as I always ask, after this cleaning, how soon would care have been recommended in the future? I love sharing these surprises with you! I hope they give you the confidence to stand stronger in your recommendations for early dental care. It is a win-win for all.